A gifted leader by any measure, Robert W. Galvin has led Motorola into a global leadership position, while simultaneously having a profound effect throughout the public and private sectors in the United States and around the world. His over sixty-year career at Motorola has been marked by a steadfast faith that things are doable, even if not yet provable. In positions that include President, Chairman, Chief Executive, and now Chairman of the Executive Committee, Mr. Galvin has led Motorola from a few hundred million dollars in annual sales to tens of billions. 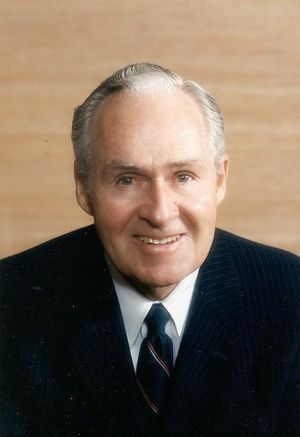 He is credited with leading the company as it made innovations in television receivers, dispatch mobile communication, transistors, paging, cellular technology, and other work. Celebrated for his vision, guidance, and intense commitment to respecting employees at every level, his leadership has also been distinguished by his use of technology road maps as a way of understanding the future. In his public-sector work, Mr. Galvin is widely recognized for his work as chairman of the Task Force on Alternative Futures for the Department of Energy National Laboratories, which came to be known as the" Galvin Commission. " His many other prominent public-sector achievements include chairing a federal Trade Negotiations Advisory Committee, and the President's Advisory Council on Private Sector Initiatives. He has held titles that include President of the Electronic Industry Association, Chairman of Sematech, member of the Foreign Intelligence Board, and Chairman of the Board of Trustees at the Illinois Institute of Technology. Mr. Galvin's education at Notre Dame University was cut short by war. Much of his education came on the job, from his father, who was a founder of Motorola. The many awards he has won include the National Medal of Technology, the World Trade Award, the French Legion of Honor, the American Electronics Association's Medal of Achievement, Automotive Hall of Fame's Industry Leader of the Year, and the Electronic Industry Association's Medal of Honor. He is also an honorary member of the Society of Manufacturing Engineers. Robert Galvin won the Golden Omega from the IEEE and the National Electrical Manufacturers Association, and is an honorary member of the IEEE. Mr. Galvin won the 2000 IEEE Founders Medal "For his distinguished leadership in promoting quality, technological excellence and' cooperation between government and the private sector, and expanding the applications of electronics and communications technology globally." This page was last edited on 25 February 2016, at 17:57.